Franklin Avenue: November Sweeps: KABC Rules, While KCAL Takes Back 10 p.m.
November Sweeps: KABC Rules, While KCAL Takes Back 10 p.m. But nonetheless, KCAL was the only station to post November-to-November growth at 10 p.m., averaging 132,000 viewers -- up from 113,000 last year. KCAL took a hit last year after losing the Los Angeles Lakers contract to Time Warner Cable SportsNet, having won 10 p.m. in 2011 with 154,000 viewers. Meanwhile, KTLA and KTTV were both down. It was another good November for KABC, which saw its 7 a.m. fortunes rise thanks to the growing dominance of "Good Morning America." 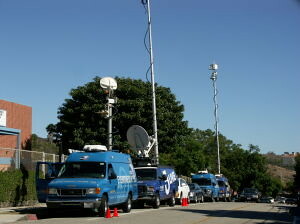 KTLA also experienced growth for "KTLA Morning News." Much of that was at the expense of "Today," which lost a chunk of viewers. Meanwhile, at 11 p.m., KABC pulled out far ahead in first place, after KCBS came within striking distance in 2012. This year, KABC was the only station to gain at 11 p.m., while KCBS and KNBC both saw some drops.